When Jorge and I have the good fortune to play a game concurrently, we like to offer two-part reviews. One of us writes the first section in which we write a normal-length post while the other person offers some brief additional thoughts. This week, we discuss Flower. Thanks for reading, and we look forward to hearing your thoughts in the comments. Titles like Bioshock and Grand Theft Auto are frequently offered as evidence that gaming is "growing up;" The games explore moral choices and contain traditionally adult themes like sexuality, extreme violence, and drug use. This trend towards thematic grit in games is accompanied by increasingly complex rules, graphics, and controls. 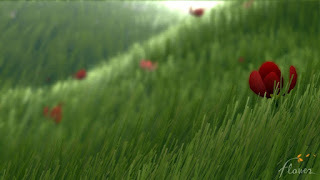 Flower, developed by thatgamecompany, stands as an alternative to the idea that sophistication requires complication. By marrying wonderful imagery and sound with alternative methods of control and storytelling, Flower's tale of growth becomes a metaphor for the maturation of video games as a medium. It is almost a shame to use words to describe Flower's visual splendor; as trite as it sounds, the game is best described as an interactive painting. 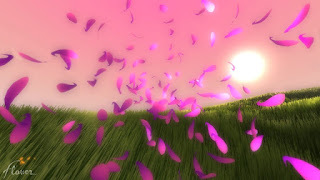 The player navigates through verdant pastoral environments as flower petals. The artistry straddles the line between simplicity and detail to simultaneously evoke a sense of familiarity in the land, as well as one of fantastic mystery. Gliding over closed flowers allows them to bloom, adding to both the body of petals controlled by the player, and the stages' lushness. The visuals are outstanding, and work to subtly draw the player into the experience instead of jumping out in front of the experience in hopes of actively "wow-ing" them. This comfortable, almost confident feeling extends to the game's controls. Flower bravely and wholeheartedly embraces the PS3's Sixaxis motion controls as the only way of maneuvering the flowers. While motion control has a checkered track record, Flower succeeds in employing the often awkward Sixaxis to mimic the feeling of wind. The motion controls in Flower are not an gimmicky afterthought, they are the product of a design choice made to augment the experience. The same type of forward momentum is assigned to every other button of the control, elegantly simplifying the most complex console control ever made. Conceivably the most controversial part of Flower is the narrative. While there are no words or dialogue to be found, Flower's presentation, musical cues, and tactile gameplay combine to present a vague story arc. While the predominant theme is growth, the specifics are left to the player's interpretation. I have heard people posit widely ranging ideas on the game's message, ranging from a diatribe on radical ecology to a traditional Christian allegory. With enough support, both of these theories, as well as many others, are plausible. Thus, Flower demonstrates not only the graphical and mechanical mechanical growth of video games, but also the growth of storytelling: Creating a vague narrative that relies on audience interpretation is a sign that the designers believe that the game is expressive enough to succeed in inspiring people, and that people are sophisticated enough to draw their personal conclusions. Flower's greatest achievement is the method in which these player-driven conclusions are facilitated. The graphics, the controls, the gameplay, and the sound all work to build a story. The absence of narration or explicit directions allow the physical act of flying to create a plot, while the environmental cues and music set the tone of the story. This game is one of those rare works that abandons expository information in favor of placing faith in the belief that the work's individual elements will congeal to create meaning. The result is an experience that enjoys an autopoietic existence. While human hands surely built the game, it manages to hide much of their influence. Even the method in which I attained the game (downloaded via wi-fi) embodies the game's tone: while the experience is not a corporeal one, it nevertheless exists and carries with it the self-created potential for meaning. In the quest to find the "Citizen Kane" of video games, are we not in danger of ignoring the "Fantasia" of video games? More troubling, by defining games with analogies, are we donning epistemic blindfolds that prevent us from experiencing the maturation we so avidly seek? Flower is a quiet game, a whimsical one, an unassuming one, but it may also be the surest sign that gaming is growing up. Its winds carry a message about the changing nature of video games, a message that suggests the medium is ready to stand on its own. It is much easier to describe my experience with Flower through analogy. If I were to rely solely on mechanical descriptions, I would not be able to pass on some of the feelings the game elicits. Above all else, this game is about immersing the player in sensations. When I first began flying through lush fields, oblivious of any obstacles or destinations, I ogled my surroundings. I was reminded of what it felt like to wander my backyard wilderness as a child. There is no user interface, no on-screen tutorial to reward or punish me, just serene exploration and the audio-visual satisfaction of blooming flowers, brushing blades of grass, and swirling over rocks. The game favors exploratory learning, and within moments I was healing the ground and testing the limits of movement and maneuverability. Very quickly I was chasing my tail and soaring upwards, just to dive back towards seas of rich colors with one thought: "This is what it must feel like to be a dolphin." Flower gradually builds these calming experiences until your incorporeal avatar encounters a mangled landscape. There are many well designed aspects of Flower, from the effective audio-visual elements of the starting room to the ingenious credits sequence, but this moment in particular marks Flower's greatest strength. Without words or an epic voice over, Flower has an unsurpassed ability to evoke a sense of purpose. It is hard for anyone with the slightest knowledge of world affairs to miss the environmental message, but the game's heavier themes are not oppressive. Flower is not unlike an enchanting political ballad, enjoyable regardless of political affiliation but designed to stir up reaction. It is an ode to exploration, play, nature, and the sensations of life. Best of all, these elegant design choices are accomplished with miraculous simplicity. I've been telling people that you never really 'play' Flower, you experience it. Truly, this is art. If more game companies would take this kind of a risk, then perhaps the industry as a whole would not seem so muddled. This game is definitely risky, I can't imagine this any other way. Also, I should have titled my review A Sense of Porpoise. As I continue with flower, I've noticed that I've begun to "play" it more: I'll try to line up unbroken strings of flowers, challenge myself with a specific route through the level, or go after the trophies. I'm trying to figure out how much of this part of the game and how much of this is my history of approaching games. Have you noticed anything similar? Yeah, I know what you mean. Now that I've finished the game, I'm going back through with a gamer's mind and really playing it, going for trophies and just setting my own personal goals. The last level is one of my favorite game levels of all time. Your new approach to Flower may have a lot to do with the type of gamer you are. Have you ever taken the Bartle Test of Gamer Psychology? It's a pretty interesting little test that I first learned about in one of my classes. My Bartle Quotient comes back as primarily an 'Explorer', which probably explains why I know where very invisible wall is in Flower!